daze of tundra: I hate your SUV! Raced CX yesterday. Oli won, which surprised me- he must have peaked twice this season: This weekend and The Olympics. ;-) I bagged fourth despite repeating my errors of the last round (too big a gear and crashing!). 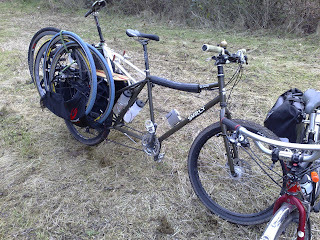 I also borrowed a Surly Big Dummy from Cass, who is away meditating in Asia. Ten days with no talking. I can’t imagine it, but it’s certainly a challenge! Anyway the bike is great! Really stable but equally more nippy than you’d imagine. It’s just really fun, and I want to play with it more! Dummy up! The most surprising reaction, McLaren said, came from the nearby Shambala Buddhist retreat for "healing and universal compassion". McLaren said: "One of the ladies there claimed she would take Glitter outside and give him a good kicking if he turned up." glad to see the dummy is getting good use. did you try it in its Electric Dummy configuration?